When it comes to crossover SUVs, the Toyota RAV4 is about as ubiquitous as they come. In its decades long journey from a plucky little crossover pioneer to a mainstream dullard, it has quickly become one of the best-selling crossovers on the market. Given the trend, there is admittedly very little need to make it into something even remotely interesting. 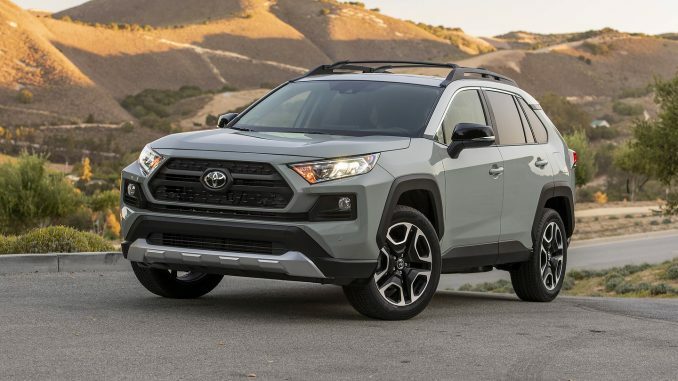 Even so, Toyota decided to add a touch of personality to the RAV4 in its latest redesign, along with more variety than ever before. The new-found personality begins, and mostly ends, with the styling. With its oversized squared-off wheel arches and aggressive front end treatment, the RAV4 is more adventurous and rugged looking than ever before. Picture a downsized 4Runner and you won’t be far off. The Trail model, in particular, looks especially off-road ready with its meaty-looking 19 inch wheels and two-tone paint with contrasting roof colours. Trail models also get a unique interior with silver and orange accent trim, contrast colour stitching, and a cool looking pattern for the SofTex synthetic leather upholstery. The interior is both well-trimmed and ergonomically sound. Perched above the air vents is a fairly easy to use touchscreen infotainment system that’s complimented by the right amount of straightforward buttons and knobs for commonly used tasks. The infotainment system uses a clear menu structure and includes an app suite which Toyota calls Entune. Apple Carplay is available as well for those who prefer, but there is no Android Auto capability. In terms of spaciousness, the RAV4 sits near the top of the pack with plenty of room for adults to sit comfortably both up front and in the back seat. The cargo area too is very spacious, but, like the Subaru Forester, lacks release levers or buttons for collapsing the seatbacks found on some rivals. 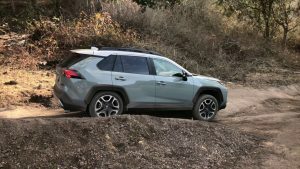 My test drive was conducted during one of coldest, snowiest weeks of the winter season, and, during that time, the RAV4 proved to be a very capable, comfortable companion. The somewhat stiff ride for which the previous model was known has largely been abandoned in favour of more compliant suspension tuning. The only notable deterrent is a slightly excessive amount of wind noise which penetrates the cabin at freeway speeds. Models equipped with all-wheel drive include multi-terrain select which includes settings for mud, sand, dirt, and snow, as well as hill decent control for a touch of off-road confidence. The Trail and Limited models get a more sophisticated setup with torque-vectoring and rear-axle disconnect. All regular RAV4 models come equipped with a naturally-aspirated 2.5L 4-cylinder engine producing 203 horsepower and 184 lb-ft of torque. The power level is more than adequate when pushed and shifts are delivered seamlessly through an 8-speed automatic transmission. The engine is rather loud under heavy acceleration, but mostly fine otherwise. In terms of fuel economy, I averaged about 12.0L/100km in the city and 8.5L/100km on the highway. Those seeking a bit more power, greater refinement, and far greater fuel economy should go for the hybrid model, which adds a pair of electric motors for a slight performance boost and quieter operation. The hybrid claims to be nearly 50 percent more efficient than the regular 2.5L models with a fuel efficiency rating of up to 5.8L/100km. The model range starts at $27,990 for the LE front-wheel drive or $30,690 with all-wheel drive. Standard equipment includes heated front seats, Entune-equipped infotainment system, and Toyota Safety Sense 2.0 with automatic emergency braking, lane departure warning, adaptive cruise control, and blind-spot monitoring with rear cross-traffic alert. The hybrid is available on the LE, XLE, and top of the range Limited for only $1,400. Unless you want the outdoorsy-looking Trail model, the hybrid seems to be a no-brainer. For $38,690, the Trail includes desirable features such as a heated steering wheel, heated and ventilated SofTex seats, a wireless smartphone charging pad, and a power liftgate. The RAV4 is in good company with popular rivals such as the Honda CR-V, Nissan Rogue, Subaru Forester, Mazda CX-5, and Hyundai Tucson. Despite the number of strong options, the RAV4 stands out for its appealing rugged persona, extensive list of standard safety features, and great value for money. The availability of a reasonably-priced hybrid model is another bonus which makes it a unique choice in the segment. Top all of that off with model’s excellent reputation for reliability and strong resale value, and you get outstanding crossover that’s well deserving of its popularity.